We are counted amongst the foremost firm, betrothed in providing a broad series of Hand Hoist for Ice Plants. Our presented product is rigorously tested under the headship of quality inspectors to attain utmost customer’s gratification. These are widely employed due to top features. Moreover, we offer at low prices. 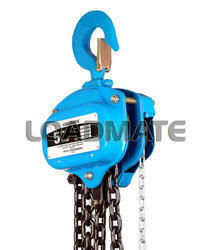 We are one of the most well-distinguished companies in the market that are into offering Hand Chain Hoist. 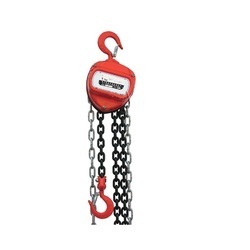 Our competency lies in trading and supplying our clients an optimum quality assortment of Hand Chain Hoist. - Used for lifting the load vertically. We offer Hand Opearated Chain Pulley Blocks from 0.5 Tons to 20 Tons load capacity. We have One of best selling hoist in the market, and offer 12 Months (Carry-In) Guarantee on our Hoists, and also offer service for Repair of any make of Chain Hoist. Weight and easy to transport. The product can be installed quickly and is lever operated for use on many applications. The load capacity of the device can be increased with a deflection sheave. Portable hand hoist for lifting and pulling loads.